Produce CAD drawings and manufacture Rotating Bed to drawing number AD-143-2013-03-1. The fixed base frame will be fabricated from 160mm x 80mm rectangular hollow section and feature a tubular centre pivot point. Adjustable nylon guides that locate around the pivot point will allow the top frame to rotate on four fixed wheels running on the base frame. 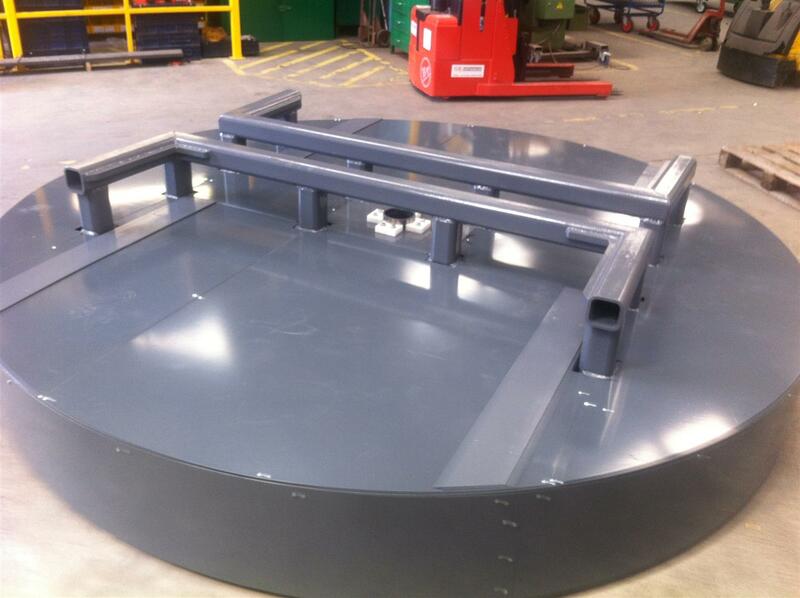 The wheels will have a polyurethane tyre on cast iron centres with bearings, each with a load capacity of 600kg. One of the wheels will be powered by an electric motor. Either side of each wheel will be a brush to remove any debris that may cause jumps during motion. The top frame will be fabricated from 80mm x 80mm x 3mm box section with 3mm mild steel cloaking panels to protect the moving parts. It will also have locating sections for pallets. Installation and controls are not included in the quotation.